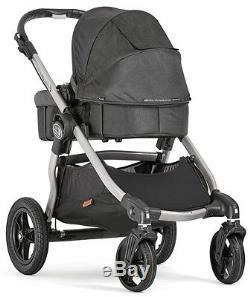 New Baby Jogger City Select All Terrain Stroller Anniversary Edition w/ Second Seat & Bassinet. The stroller that grows with your family. Whether youre looking for a travel system, a pram, a double stroller, a triple, or just a single, the City Select could be the only stroller youll ever need. The most versatile stroller on the market today, the City Select was designed to keep your family rolling as it grows from one child to two or even three. The City Select is not intended for jogging. Upgrage Model of City Select 10th Anniversary Edition. Converts from Single to Double Stroller. 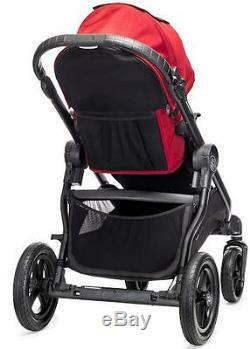 Grows from a single to a double stroller with the Second Seat Kit. Over 16 unique combinations, including two car seats or two bassinets. Add the Glider Board to accommodate up to three children. Special Edition Knit Fabric and Leather Accents. Inspired by fashion and lifestyle trends. Multiple recline positions while facing forward or backward. Adjustable footwell and canopy height allow you to adjust your seat size. 3 panel canopy with UV 50+ protection and one peek-a-boo window. 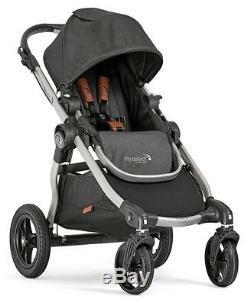 Patented Quick-Fold Technology allows you to fold your stroller in one step. CHANGES TO THE NEW MODEL. Snap the latch to lock the stroller for transportation or storage. With over 16 possible configurations you can make the City Select work for your family. Front facing, parent facing, sibling facing: whatever you need. Add a Second Seat to make it a double. Throw in a Glider Board and youve got a triple. (Infant Car Seat, and Glider Board NOT INCLUDED). This seat was built for comfort. It offers multiple recline positions to make sure that your child is comfortable and safe. Weight capacity per seat and multi-position footwell, your kids can kick back and enjoy the ride. A telescoping handlebar adjusts to your height and a hand-operated parking brake keeps all the controls within reach. 12" forever-air quick release rear wheel tires and 8" lightweight dual front quick release wheels, Front wheel suspension and sealed ball bearings with swivel lock. The City Select can become a travel system in a heartbeat using the Car Seat Adapter. Just choose the adapter compatible with your car seat and youve got a customized travel system for your infant. 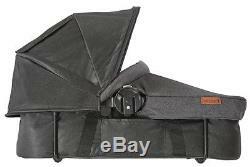 You can also add a Bassinet Kit to handle even the littlest of passengers. 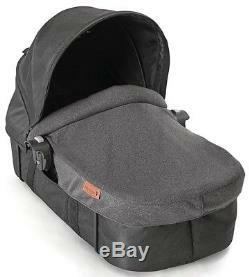 (Car Seat Adapter, Infant Car Seat, and Prams NOT INCLUDED). 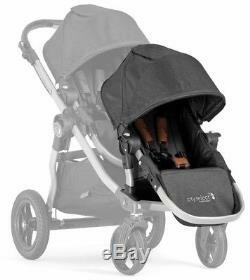 The City Select Bassinet Kit converts your City Select seat & canopy into a Bassinet with just a few simple steps. Padded carrying handles, machine washable mattress cover and a foot apron to protect your newborn from the sun make this a very popular accessory with City Select owners. Restrictions: Newborn 6 months, Max. Not intended for overnight sleeping. Compatible with the City Select only. Number of Seats : 1 or 2. Child Maximum Weight : 45 lbs per seat. 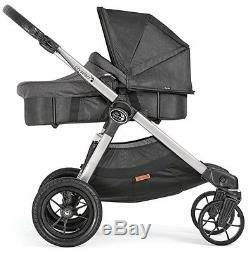 Travel System Compatible : Yes - With Adapter (Not Included). Dimensions Unfolded : 43.5" x 25.75" x 38.5. Dimensions Folded : 12.5" x 25.75" x 32.75. Seat Back Height : 18.5. Knee to Footplate : 9.25. 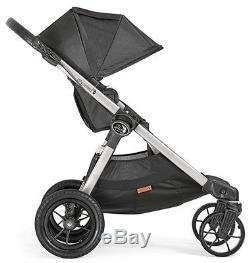 The item "Baby Jogger City Select Twin Double Stroller Anniversary Second Seat & Bassinet" is in sale since Wednesday, March 7, 2018. 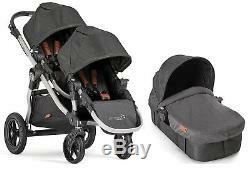 This item is in the category "Baby\Strollers & Accessories\Other Strollers".